Twenty-one year old Larissa Chakroborty (better known as Jasmine) has been forced into the company of her parents' friends' son, twenty-five year old Tanveer Bhattacharya (aka Veer) ever since she was thirteen and he was seventeen. Jasmine found herself slowly getting drawn towards this teenage boy and harbours an unrequited crush on him, long after he disappears from her life in order to pursue a college degree. Eight years later Veer returns. and makes her a rather strange proposal. He wants her to pretend that they're in love and would eventually settle down in life, for he wishes to avoid tying the knot with a girl of his parents' choice. 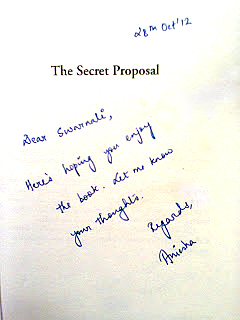 The constant ego battle between the two, the love-hate relationship, break ups and realisations is what The Secret Proposal is all about, wherein love would eventually find a way. Is it enough to get your long time love to be in a 'pretense relationship' with you? Does one grand gesture convince you that you've found your knight in shining armour? And why is it that when you have someone, you don't want them… and when you lose them, you want them back? 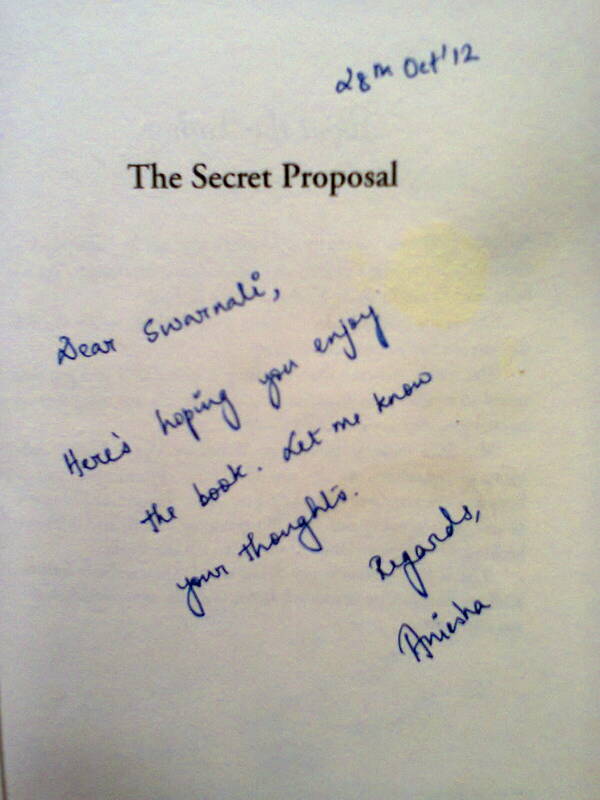 First thing , I totally liked the personalized note that Aniesha added to the book before sending it to me. Thanks ! I loved the gesture. What all we have not done or would not do to spend time with our crush ? To be in his good books always and to hope that one day he / she would realize the intentions ? But is it so easy to look past a person's defenses and intentions ? Do we not usually think just our side of the story unless some one else points out what we always missed to register and acknowledge ! Can you ever not fall in love with some one who lets ypu be who you are and still likes you ? Well , love is a hard feeling to accept , express and more so , convince the other person. Jasmine is your usual girl who has forever been in love with Veer and yet he can't like all of him. He is sure arrogant and has a terrible sense of humor as per Jasmine but only she knows he is also caring , respectful and oh so charming forever. Both Jasmine and Veer love coming together even if as an arrangement or "the secret proposal" but both fail to hold on to the connect. And from there is one mis-event after another till the sweet reunion in the end. The book is a fairly engaging read and entertains not just with the love story but the festival life of Kolkatta comes so vividly alive. I loved reading about all the pujo days and the wedding ceremonies and the way Kolkatta celebrates. A plus it is to the book and shows the beautiful observation skills of the author. The writing is easy but not casual. The storyline connects the reader to Veer's and Jasmine's thoughts and intentions though Veer is such a confused character. I absolutely loved Meghan , the best friend character. What would we do without friends like her ? The flaws / the minor negatives if I must point out here would be Jasmine fainting so much !! Was it 3 times or 4 ?? And totally not cool when there were 2 guys fighting for her !! Plus she is kinda too stubborn in her ways at times when she is avoiding Veer. Ok, not so much uncalled but I so wanted to hold her and give her some sense. A few scenes look dragged but they are tied well thankfully. Do try it any day for some smiles. And oh , don't forget to check the poetry in the Preface ! Its absolutely wonderful. This one was good. I loved your observations.